Store International Exploiting Images and Image Collections in the New Media: Gold Mine or Legal Minefield? 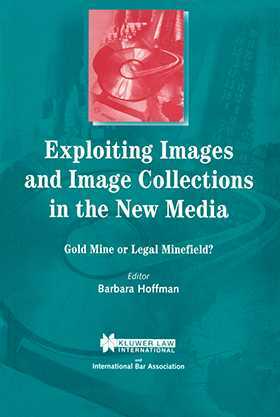 Exploiting Images and Image Collections in the New Media: Gold Mine or Legal Minefield? This book takes as its primary focus the copyright and other intellectual property issues which arise out of the commercial exploitation and digitisation of images. The digital revolution is taking software companies, educational institutions, museums, and motion picture and photo archives into uncharted legal and technological terrain. In particular, the nature of digital images makes more evident the legal, ethical and practical problems that are as yet unresolved in the print media. New information technologies have pushed to the forefront the use of images for commercial products as software companies search to acquire rights to scan photographs or paintings in libraries, photo and film archives and museum collections worldwide. At the same time museums and archives using multimedia to open up their collections to the public recognise that they hold financial assets capable of commercial exploitation. Fourteen articles written by prominent intellectual property lawyers and government officials discuss legal, policy and practical issues in the protection and commercial exploitation of images and image collections. The essays present the views of various industries and governments, and provide national perspectives from Argentina, France, Germany, India, Japan, Malaysia, the United States and the United Kingdom, as well as a discussion of efforts at international harmonisation. The book includes a useful collection of original source material and sample forms in appendix, including an annotated CD-ROM Licensing Agreement. Exploiting Images and Image Collections in the New Media will provide a valuable and unique resource for intellectual property and media lawyers, executives in the entertainment industry and new technology companies, museum directors, policy makers and regulators.